I love kids! I’ll fully admit that. I’m also rather good when it comes to taking care of them. One summer, I was volunteering for a daycare program where I helped take care of a classroom full of PreK kids. You’d always find me sitting down and playing with them or outside during our schedule playground time either pushing them on swings or getting caught and thrown into jail only to escape and get caught again five or six more times. However, I’ve never given much thought into becoming a parent; mostly because I know it’s something I’m not ready for. That doesn’t mean I can’t appreciate the ones who are parents. Especially the first time ones. 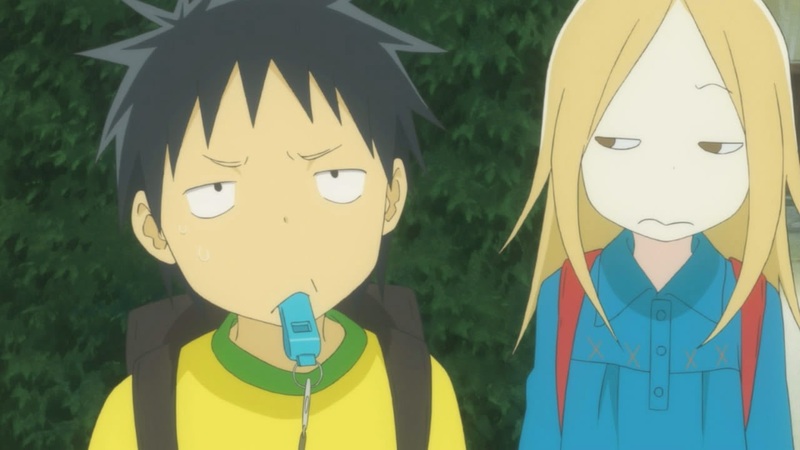 Bunny Drop, AKA Usagi Drop, is an 11 episode Slice of Life/Comedy based on the manga by Yumi Unita and published by Shodensha. The manga is currently available in the US and UK thanks to Yen Press. The anime from Production I.G. and director Kanta Kamei aired during the Summer 2011 season. As of this review, the series is licensed in the US thanks to NIS America and the UK thanks to MVM Films. It is also available for legal streaming thanks to both Crunchyroll and Hulu (US only). It’s interesting to see this kind of series come from Production I.G. because I’ve mostly seen action oriented series from this animation studio. I honestly would see Usagi Drop as something studios like Brains Base or maybe even P.A. Works would do, but I do have to praise I.G. for their work on this series. The animation can be talked about in two different capacities. The first is a kind of coloring book look that occurs at the beginning of each episode until the opening theme. Some people may see this is some lower quality animation or even a budget problem, but I see this as more of a nice creative choice. Thematically speaking, this little touch of animation at the start of every episode may seem jarring but I think it makes it stand out even more. The second kind of animation the series has is what you would see throughout the rest of the episode, a rather simplistic style and light in both color and tone. It’s good that this is the animation we get to see for the majority of the series because, like I said, the coloring book style can be rather jarring at times. If the entire series used this kind of animation, then some may be put off by it. As for the soundtrack, it is beautiful with simple orchestral tracks that fit the mood of the series really well. And the theme songs are both fun in music as well as animation, taking on more of the coloring book style and full of color and bunnies. 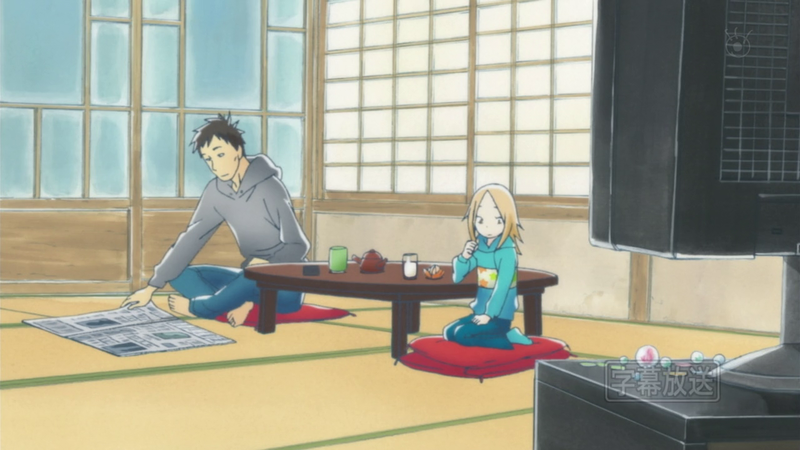 Usagi Drop takes place over the course of the first year that Rin lives with Daikichi, giving us little moments throughout that stand out as important to the two of them. 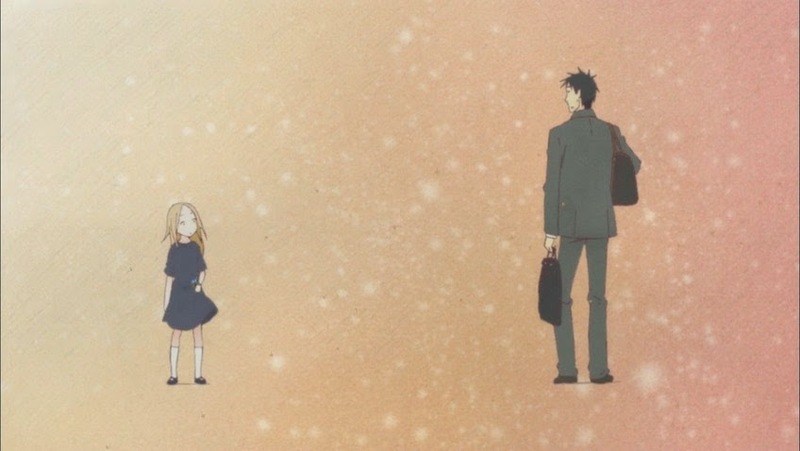 Rin’s first days of elementary school, her first real friend, and even her first time getting sick. These episodes seem to fall into a more episodic form of story telling, with no real sign of an ongoing plot. If there was any kind of plot, it would really simply be Daikichi raising Rin for the first year they are living together. It has honestly been a while since I’ve seen a beautifully written show that isn’t one I’m currently following through simulcasts. It’s because of that simplicity that the charm of the show along with it’s major theme really can shine through. The theme I’m talking about, in case you haven’t caught on yet, is the theme of parenthood and the struggles of it. With the series coming from Daikichi’s perspective, his change from single bachelor to father figure is something interesting to see. I’m not a parent, at least not yet anyways, but I do know friends who are parents and it’s interesting to see how their lives change after having a child of their own. That same change can be seen here in Daikichi, hence what makes the story rather heartwarming to see. I do have to give a fair warning about the manga, however. I’ve talked with many people, and even did my own research, and I suggest you tread lightly in reading the manga. That’s because it decides to get a little weird on us with a sudden love story line, and I’ve been told it has made some people a little uncomfortable. I just say watch the anime and pretend that the manga doesn’t exist. Although there are a decent amount of characters in the series, I picked only five to focus on because they are the ones we see the most of and, therefore, have the largest impact on the series overall. First, of course, is Daikichi. As our leading man, Daikichi is one of the characters that goes through the biggest change since taking Rin in. He’s just like any struggling single parent, but, at the same time, this is his first time parenting and he has no idea what he is doing. This can make for some rather funny and cute moments when he tries to figure out what to do. He’s also a natural at parenting, as we can see with his interaction with, not only Rin but, other children he comes in contact with through Rin. Daikichi’s development is as natural as you would expect it to be, making me all the more happy. Next we have to talk about Rin. She is also a character that goes through a big change in the series. In the beginning, she’s quiet and shy, feeling like she’s a burden on the entire family. However, as Daikichi starts to raise her, she becomes more open and trusts people much more easily which is another naturally developed character right there. 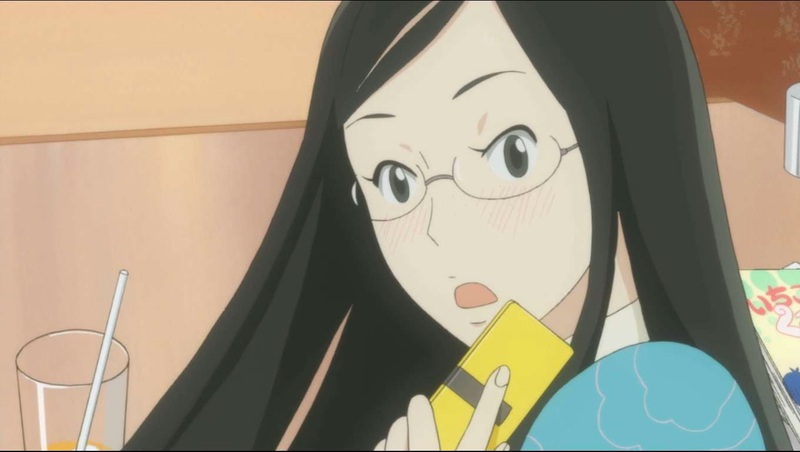 Next, I want to talk about Rin’s mother, Masako, because she is another interesting character that pops in quite a bit. Masako and her story is a bit more saddening because she gave Rin up due to her sudden fame as a manga author. Over the course of the series, we see Masako try to distract herself from her choices and dive into as much work as she possibly can. Although her story line didn’t resolve itself in the end, it at least gave us a decent stopping point as she does start to reflect even more. Lastly, I want to talk about Koki and Nitani. 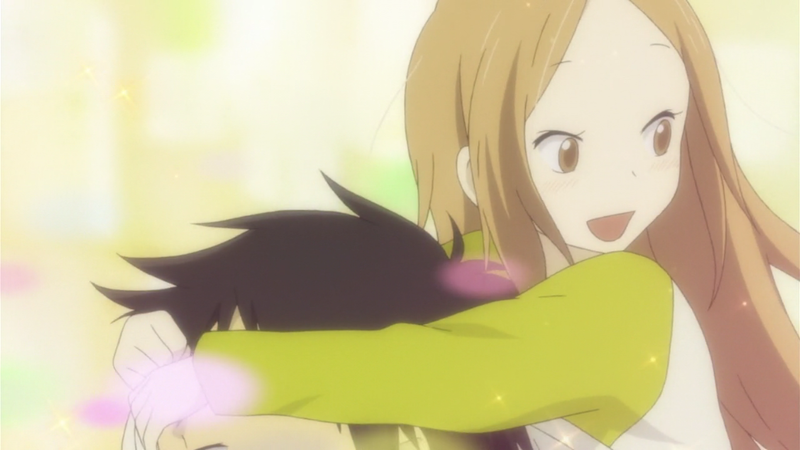 Koki is Rin’s friend from daycare who becomes attached to her because his mother, Nitani, is also a single parent. This, in turn, gives Daikichi someone to turn to at times whenever he’s not sure how to handle certain things as well as someone to have a little bit of a crush on. 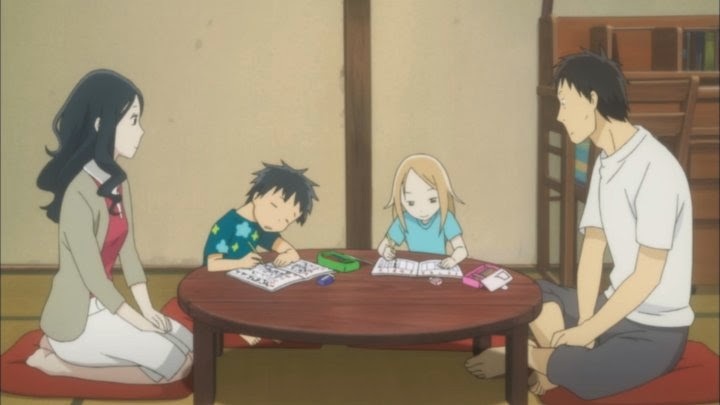 It helps make for a nice balance because it gives Rin a kind of motherly figure in her life as well as give Koki a fatherly figure that he hasn’t had in a very long time. With a rather strong story line and characters, is the language track all that good? Heck yes it is! Leading the pack in the Japanese voice acting is Hiroshi Tsuchida (Log Horizon, Texhnolyze) as Daikichi. There were times where it didn’t seem to fit, but, then again, as a first time parent it actually works and made for a wonderful performance. Little Ayu Matsuura (Eureka Seven AO, Mushi-Shi: The Next Chapter) plays Rin and it was something truly adorable as she brought the character to life almost effortlessly! As a young actress, it’s very commendable. Also, among the young voices for this series, Noa Sakai (Kuroko’s Basketball) takes on Koki and it was as rambunctious as a little boy can get which made for some fun! As a kind of polar opposite, Sayaka Ohara (Fairy Tail, Persona 4: The Animation) plays Nitani as a rather sweet and caring individual which brings in the motherly influence for Rin even more! Then there’s Maaya Sakamoto’s (Black Butler, The Vision of Escaflowne) performance as Masako, which shared some traits with Rin and Matsuura’s performance, being the quiet and hardworking woman that she is. Overall, the Japanese had a very solid cast that managed to have some fun while playing up the charm in the series. 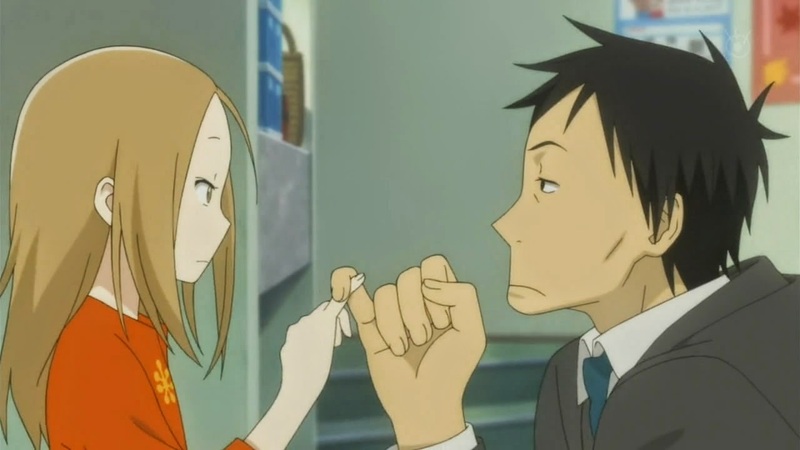 There’s a reason why a lot of people I’ve talked to love Usagi Drop. It’s simple, it’s charming, and it has a story that has the trials of parenthood in mind. 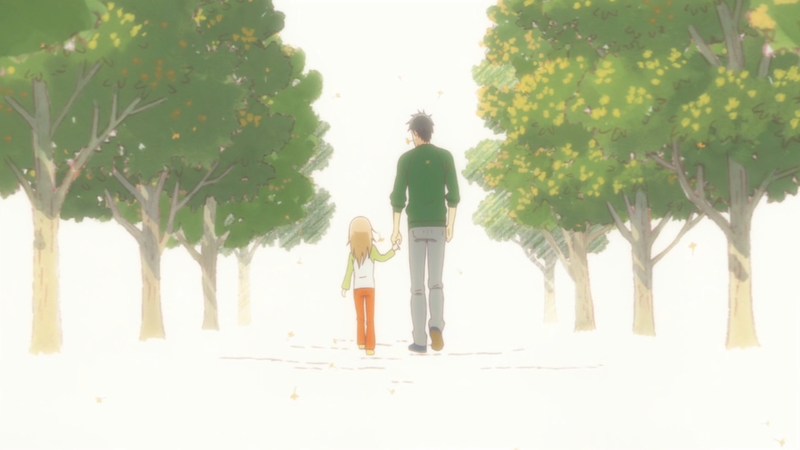 This is one of those series that I just can’t not recommend because of all the sweet little things it has. It’s been a long time since I’ve seen a beautifully charming series, and I am very happy to have finally sat down and watched Usagi Drop. 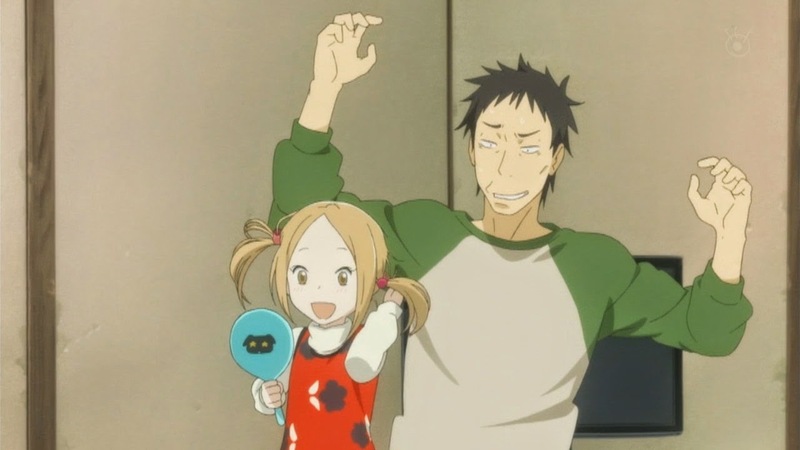 If you are looking for a simple slice of life series that somehow manages to bring your paternal instincts out, along with some laughs, then give Usagi Drop a go! I honestly think everyone should!…. Though I’m still not going to read the manga…. That’ll just ruin it for me. Next time, we “burn to nothing”. Until then, otaku on my friends! Finals Grade: 9/10 A sweet story about the struggles of parenthood.